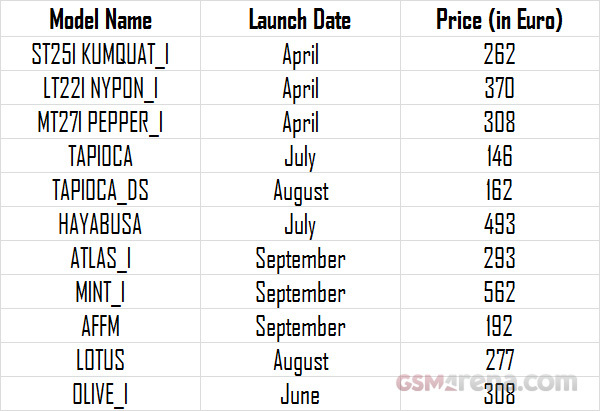 We have with us the prices and approximate release dates of upcoming and yet to be announced Sony handsets. This information was allegedly leaked through Sony's sales report in India. The prices and dates, as such, are for the Indian market but should be applicable in most European and Asian countries as well. Though we received the prices in INR, we've converted them into Euro for your convenience. First of all, we'll talk about Nozomi, which as we saw at the CES, turned out to be the Xperia S. The first Sony branded phone after a long time will be getting released in March for €462. The information aligns nicely with the currently available pre-order listings by Clove UK. You can find out more about the Xperia S in our hands-on. So with the Nozomi out of the list, what remains is the rest of the models listed below, which are yet to be announced. Some of them, such as the Nypon and Kumquat are familiar names but some of the others, such as Hayabusa and Atlas are something we are seeing for the first time. As usual, these are code names and not likely to be called the same after launch. All the phones listed below run on Android. It looks like Sony is going to have a very busy 2012. And judging by the prices, it seems Sony will have some cool high-end announcements ready at the next month's MWC. Thanks a bunch for these, Karmic.